The Lake Tahoe Basin Management Unit of the U.S. Forest Service has approved a project to improve recreation at Fallen Leaf Lake. 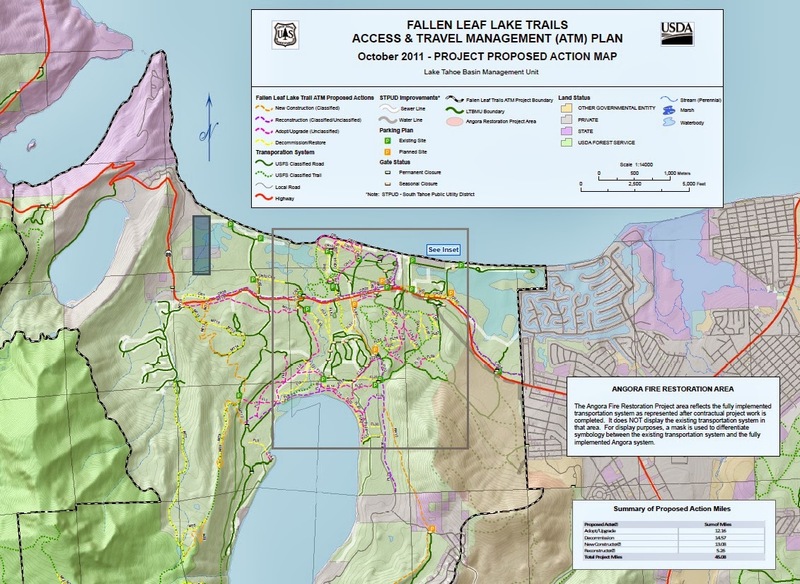 The approval decision was based on a "finding of no significant impact", to the areas at Fallen Leaf Lake and Lake Tahoe. Project area. Click to enlarge. The ambitious plan calls for the alteration of 45 miles of trails. The current trail system is a collection of planned trails, existing roads, and unauthorized trails. Some would be decommissioned, upgraded or added. Trail access will also be improved by adding several new parking lots and eliminating "informal" parking lots. The eclectic bridge over Fallen Leaf Lake dam would be removed and replaced with a bridge designed to meet contemporary building codes and standards. Construction work could be begin by spring of 2014 and could take three to five years to complete, depending on funding. Part of the funding is by the Southern Nevada Public Land Management Act as part of the Environmental Improvement Program.